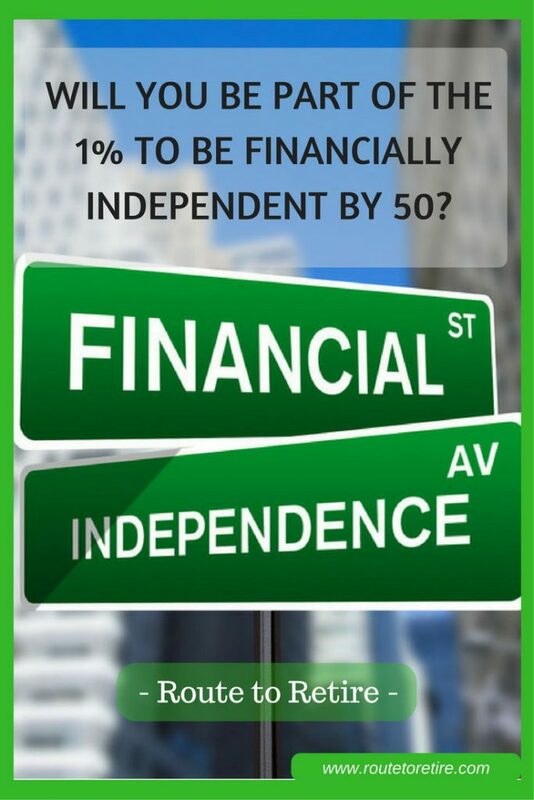 Will You Be Part of the 1% to Be Financially Independent by 50? If you’re not familiar with Paula Pant from Afford Anything, you should take the time to check out her site… especially her podcasts, which are fantastic. I’m usually a little behind on my podcast rotation, but I just listened to another good one recently that fascinated me. Clark Howard was her guest in #47: How to Stop Being Your Own Worst Enemy. I’ve always enjoyed Clark Howard – I’m not sure if it’s how down-to-earth he is for a guy who reached financial independence at 31 or just how happy the guy always seems to be. Either way, my wife and I used to really enjoy watching his show that was on HLN a number of years ago. What really stood out to me in this podcast was just how intelligent Clark is. We were always able to tell from his TV show that he was a smart guy, but listening to him on this podcast really gave him an opportunity to shine. That’s great Jim, but why are we sitting here talking about Clark Howard? Not everybody’s gonna be able to become financially independent… you can only grow the pie overall so much. It’s really almost a Darwinian process of who is going to choose to be the individual who creates financial space and independence and freedom in their lives and who doesn’t. And so it’s a winnowing of the herd and it’s a natural selection process. The thing is, there are lots of people who talk a good game – it’s executing it and sticking to it over a long period of time. Clark’s talking specifically about how most people are not going to be able to become financially independent. In other words, not everyone is going to have enough money to be able to quit their jobs when they want to. But the question is… why? The answer may vary, but in my opinion, I think a lot of it has to do with what people actually do with their money. Sure, some people barely make enough money to get by, but what about the rest of the middle class? You would think that most everyone should be able to become financially independent if they wanted to do so, right? What makes me raise an eyebrow is just how few people are retiring before their sixties (or even after that!). Now, this might not tell the whole picture. I’m sure that some folks are able to retire, but just don’t want to. However, I’m going to guess that for the majority of people, becoming financially independent and actually being able to retire when they want is just a far-out dream. Personally, I don’t think the problem is that people don’t make enough money to make this dream a reality. I think the problem is that a lot of folks just do the wrong things with their money. 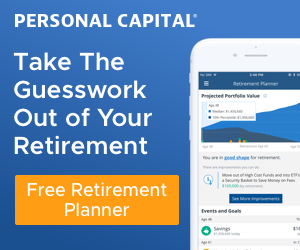 Here’s how much the average family has saved for retirement at every age (according to this article, the median amount of retirement savings for those between 32 and 61 years old is a mere $5,000… what?!!!! In a nutshell, people are still struggling to save for their retirement. But why are they struggling? Is it that they don’t have a desire to become financially independent? I doubt that’s the case. I swear everybody and their brother has the dream of hitting the lottery and quitting their jobs. I probably hear that once a week from different people. Call me pessimistic, but I’m thinking that the odds of winning the lottery are a little low. I know, I know – I’m being a Debbie Downer on this… sorry about that. So why aren’t people saving more for retirement? I think a lot of it comes down to drive. The Steps to Wealth aren’t far-fetched and I think anyone can get on the right path and make it happen. Look at that belly!!! I think a lifestyle change is in order here. 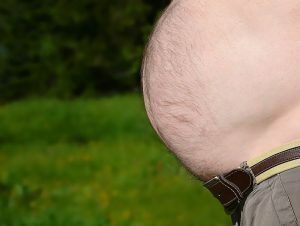 Please note this is NOT a picture of my big ol’ belly! The problem to me seems similar to trying the latest diet fad. If you or someone you know has ever tried to get on a diet, you know that they rarely work. It’s because it ain’t easy and people don’t want that. In general, they want results now and they don’t want to give up anything along the way. That’s why those who don’t try to just diet and instead make it a lifestyle change are the ones who are successful and are rewarded for it. Becoming financially independent is similar – it doesn’t work to just try to save some money and call it a day. You need to make a lifestyle change and work for it. In actuality, it’s not that hard, but it is a change in mindset. But if you do make the change, you’ll definitely be rewarded for it. So what needs to be done to make it happen? Stop buying crap and start doing something! Mrs. R2R spending all our hard-earned money on one shopping spree. Just kidding – it’s just another random Internet photo I found. One of the struggles I see with some of the people in my life is that they struggle with FOMO. They spend money like it’s going out of style. They buy crap they don’t need and then try to justify it to themselves with the “you only live once” mantra. However, that doesn’t mean you should go out and buy the biggest house and TVs and brand new shiny cars you can afford… because you probably can’t truly afford them in the long run. If you’re buying all kinds of crap because you’ve convinced yourself that you only live once, you’re probably going to be working for the rest of your life. My dad got fired from his job that he’d worked at for 29 years when I was a teenager. I thought that my parents had plenty of money… they had plenty of possessions, but they didn’t have plenty of money. When my dad lost his job, they were living on fumes and I was trying to figure out how I was going to get through college. It’s never what you make, it’s what you don’t spend that actually matters. Most of us know this scenario. Whether it’s you or your family in this situation, it’s time to turn things around and build a secure future. Beat the odds and be one of the 1%!! 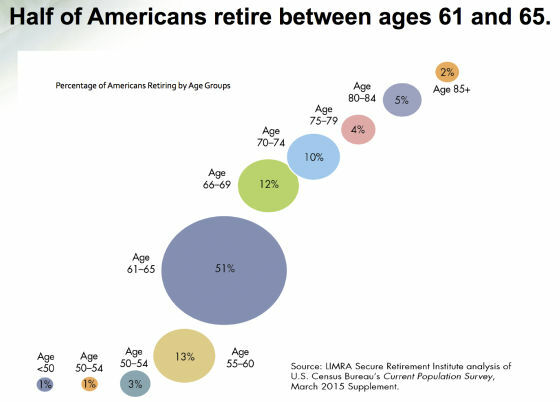 If you look at that chart earlier in this post again, you’ll see that less than 1% of people are retiring before age 50. If you’re under 50, put this on your radar to become financially independent. Whether you actually decide to retire by 50, don’t you want the option to decide? Some of you might think pushing 50 to retire is just dreaming. But, I can tell you that if you think that’s the case, you’re in for a shock. Pete at Mr. Money Mustache – probably the most well-known of the early retirees, he retired at age 30 and spreads his frugal ways to a giant Internet audience. Joe Udo at Retire by 40 – retired from his engineering career to become a stay at home dad/blogger at 38… also was a very big inspiration for my own path to financial independence. Sam Dogen at Financial Samurai – reached retirement at age 34 – author of “How to Engineer Your Layoff”. Brandon at Mad Fientist – retired at age 34 and brings some crazy cool information on topics like tax strategies that can help you retire even earlier. Mr. Tako at Mr. Tako Escapes – reached FI at 38 after earning his millions the “hard way” – one day at a time, one penny at a time. Steve at ThinkSaveRetire.com – just retired at the age of 35 so he and his wife could travel the world. Michael H. at Financially Alert – retired in his mid-thirties and is a stay-at-home Dad, blogger, and investor. Justin at Root of Good – retired at 33 and continues to be active all over the personal finance realm of the Internet. Jeremy at Go Curry Cracker – retired in his 30’s – he and his wife lived simply, saved up, and now travel the world. Mr. and Mrs. 1500 at 1500 Days – in their early 40’s and the goal has been nailed – Mr. 1500 is just about to wrap up his formal job as we speak. 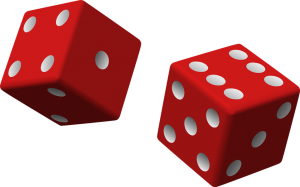 Jim at Route to Retire – Ok, I’m not quite there yet, but I finally hit a million dollar net worth and I’m definitely on track to be financially independent while still in my 40’s. Believe it or not, retiring at 50 is not that far of a stretch for most of us. It’s definitely possible, but you can’t just want it to happen, you need to make it happen. Aim high and actively work toward your goal. Save a high percentage of your income and work to build up other income streams such as a rental property or owning your own business. Before you know it, becoming financially independent will be more than just a far off dream and you’ll be free to live the life you truly desire. Is becoming financially independent on your radar or is that just something you consider wishful thinking? ← $1 Million Net Worth… Now What? It’s interesting. Of me and my wife’s parents we see three different retirement scenarios. My father and mother worked into their sixties. My father stopped working due to health. He was forced and didn’t get to choose his time. This is a big reason I’m a proponent that everyone should save for financial independence regardless of if retirement is in the plans. It may not be your choice. My mother could only retire once she met pension age. She’s still struggling with one more year, but never could have retired before her sixties. My in laws retired at 70. From what I can tell the easily could have retired before sixty but chose to keep going because they loved their job. Still there always had the option. I want to be closer to my inlaws, though I doubt I’ll still be at it in my sixties. You make a couple excellent points there, FTF… if you love your job, then by all means, keep going with it. But regardless, you never know what could happen, so saving for FI should still be at the top of the list. That’s cool that enjoy your job and want to keep working until later in life. I wish I was that way, but I feel like I’ve got a lot of other things that I want to do and don’t want to miss my opportunity because I’m working 40 hours a week. Although I’m still more than a few years out, I’ve scheduled my finances to facilitate retirement at 50. House will be paid off, should have over a million in the bank (if my index funds play along), and the pension should cover my living expenses. Congrats on being on track to be able to retire at 50 if you wanted to… that puts you way ahead of the game and part of the few that are able to pull it off! The podcast is great indeed. Paula is in my list and i regularly listen to it. Same with the mad fientist podcasts…! Ha! The inefficiencies here are definitely amazing and sad. On a brighter note though, I enjoy both of those podcasts as well… Brandon (Mad Fientist) seems to bring in some worthwhile guests as well. Many of my coworkers and friends think they’ll work until 65-70, but I worry they won’t have the opportunity to. I need to catch up on listening to Paula’s podcast, good stuff. Thanks for sharing Jim. That’s fantastic, Amy! Whether it’s 35, 45, or 55, it’ll be an amazing accomplishment! If you consistently save money each month it shouldn’t take till 60’s to retire. If you manage your expenses and savings it’s really possible to retire early. Now how early would depends your personal situation. My wife and I are in our early-30’s now. Given the hot Vancouver real estate if we sold our house and move somewhere else, we can certainly retire early today. But we choose not to. We are continuing with our plan of reaching FI in early 40’s though. That’s awesome, Tawcan – I wish I knew as much as guys like you when I was your age. Early 40’s is fantastic, especially for not giving up things you enjoy (like your house) to get there. Being able to retire early shouldn’t have to be a compromise to get there and it looks like you’re well on your way to proving that! I never knew there were so few people retiring in their fifties. I am personally not targeting retirement in any meaningful sense at the moment, but I want to have options. And, as is well known in our community, building wealth is the best way to freedom and options. That was certainly a surprise for me as well. I definitely agree that although not everyone wants to retire early, the key is to build enough wealth so that you can if you want to or need to. Yes, I plan on retiring at 41, very soon. Most people I know have no motivation to retire early. It takes a certain frustration with life and the status quo, along with being a very interesting person, to take steps to retire early. It’s never been a question for me, I read about financial independence at age 18, even talked about it with my head manager when I worked at McDonald’s, and he told me about his saving and investing. I can’t even contemplate not investing a huge sum each check, but these people are all around me at work and in my neighborhood. Great post. I think that another possible explanation of those retirement numbers is the mindset that you “have to” work until traditional retirement age. Certainly for me, before I learned much about finances and FIRE, I just assumed that I would work, work, work until my 60’s and retire then. I just thought that that’s what working people did. Good point – the best thing for me was waking up one day and realizing that you don’t have to do that. But even though we’re getting much closer to FIRE, the few friends in the loop still don’t seem to believe that it’s possible to do. I am targeting FI more than RE, because there are so many things out there to do, but they don’t pay enough for me to live on. My grandparents generation 55 was the retirement age, and 3/4 passed around age 72. As I’ve watched the age creep up, it has inspired me to get to FI. My grandmother passed very unexpectedly from an aneurysm that is one of those ‘unless you are looking for it’ no one knows it’s there type things. My grandfather on the other side survived a heart attack at 62, and my dad for all his exercise & healthy eating also just survived one, but if he had been alone, maybe not. My dad was early retired with a change in management and because of saving & investing well has not gone back to work, and instead joined boards and committees. My mom got fed up with politics in the administration and retired early. She recently started helping a friend with science lessons a few hours a week. She and her friends did a trip last summer on a viking river cruise, to make the memories now. I want to have the freedom to have a job end and say, ok thanks, and wander off to the next adventure. Thanks for sharing that story, Jacq. They say that money can’t buy happiness, but it can definitely buy independence and freedom. That’s fantastic on the mid 40s for your FI date… you only live once and hopefully you have plenty of years to enjoy doing whatever makes you happy after that! At this rate I should be in the top 1% in terms of wealth in just a few years. However, I’m not going to stop at 1%. My goal is to be a billionaire by the time I’m 45. It seems like a lofty goal, but hey, you never know. Thanks for the mention Jim! I completely agree. It’s not about making big money…it’s sticking to your plan for a decade or more…..ruthlessly sticking to it. Like a crazed maniac beast! Roar! I think it is great that folks will be FI by 50. Unfortunately, we won’t be quite FI by 50…it is more like 52/53. I would like to accelerate it, but it depends on increasing our savings and we are trying to have a kid later in life so we are starting that really late. We will get there, but my plan is FI at 52. 52 is outstanding and still a rarity out there… good luck and enjoy the journey! I’m not a big fan of chronological age based agendas, but FI by 50 seems to be a reasonable one. I just turned 50 and am FI. I’m super-glad to have options given me by FI. I’m going part-time now. I still want to work, make money, and have good benefits. But I’m not living paycheck to paycheck either. After decades in the workforce, the body and emotions can wear a bit even if you love your job and career. As politics change and kids get older you may want to change your job or hours. FI gives us that option. RE is an option, but not a requirement after reaching FI. Thanks, WealthyDoc – love the way you put it – RE is an option, but not a requirement after reaching FI. If you love what you’re doing, no reason not to stick with it or cut back on your schedule like you’re doing. For me, I don’t love my career anymore so FI will be my chance to try some other things and, if the money follows, great. However, it won’t need to be the driving force anymore.